What are the most common “break downs”? By far the most common are Suspension problems. The extreme cold makes everything brittle, combine that with such excessive abuse and additional gear weight over an extended period and parts begin to fail. Next to that may be good old fashioned running out of fuel. Most riders carry an additional 3 to 6 gallons beyond the OEM fuel load. What are the funny boots most Iron Dog racers wear? They are called ‘Bunny Boots’ due to the fact that they are big and white similar to the hind legs of a snow shoe rabbit. Think of two pairs of rubber boots, sealed one inside of the other with insulation between the layers. They can be easily recognized by the valve (similar to Schrader valve) used to equalize pressure. They are not comfortable, compact, stylish, supportive or even durable. The only thing they have going for them is since the insulation is sealed inside it cannot get wet, even from water pouring down the inside of the boot. Dry insulation means warm feet. So it is really more of a safety factor and also keeps the racer from packing multiple sets of boots or liners. However they don’t breathe so your feet will always be wet, they often get stuck in the foot wells because they are so bulky and they don’t stand up to long term use. Racers have been known to coat their boots in petroleum jelly to prevent them from binding in the foot wells! It is without a doubt, “who grooms the trail?” This shows the common lack of understanding. Only the entrance to the race is groomed. Sometimes there is no trail. Sometimes the race course has been changed to avoid open water on some of the warmer races. Has an all-women’s team ever finished the race? Yes. In February, 2001, the first women's team finished the Pro-Class race placing 15th in 60:23 hours. Jackie Page and Missy McClurg are in fact the only all-female team to have successfully finished this race to-date. How many people have died during the Iron Dog? Although the extreme conditions, terrain, and speed, by nature can be life threatening, no death has so far been directly attributed to the race. Injuries such as sprained or broken ribs ankles and wrists and frostbite and dehydration are common and the extreme cold makes them all the more painful. What’s the difference between a Rookie and a Veteran? 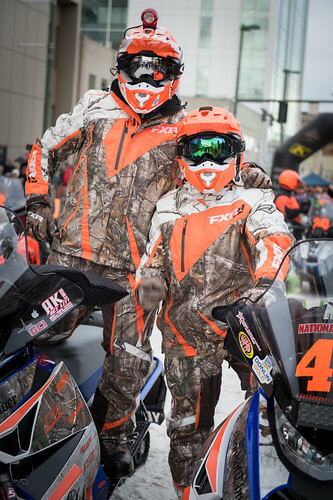 Unlike many other sports and races, the Iron Dog maintains a long-standing tradition of giving "Rookie" status to all racers who have never FINISHED the Pro Class race. Veteran status is only given to a person who has successfully completed the Pro Class race by crossing the finish line. (Note: Finishing the Trail Class ride doesn't make a Pro Class veteran, they are still Rookies). How long is the distance between check points? Usually check points are less than 100 miles apart, though the longest is a 120 mile spread. What services are available at the checkpoints? Fuel. Everything else varies. Some checkpoints have been no more than a tent. What type of racing fuel is used? Racing fuel is not used. It is automotive fuel that is flown in and air dropped at the several locations. In some remote locations, the fuel sits for months before being used. It can become water contaminated or lose most of its octane. Sometimes it is even ‘summer’ fuel or fuel that was originally formulated for use during the summer and can cause havoc in the winter due to lower vapor points. 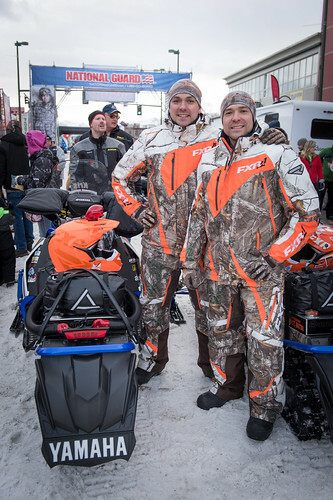 The fuel is provided to the racers by Iron Dog but at a great expense often times more than $8.00 a gallon. What are the common mistakes that new racers make? Novice racers most often over pack and under drink. No we are not talking about alcohol. Dehydration is the most common ailment. 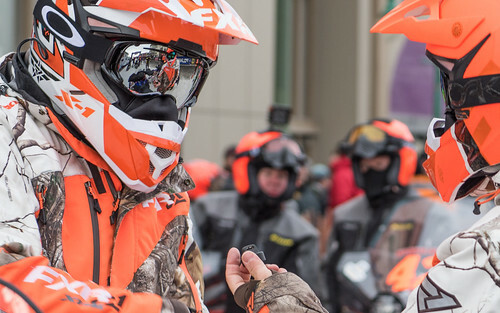 The body loses a tremendous amount of water when you’re active–no matter the temperature and the Iron Dog racers are more active than you can imagine. Racers are required to pack a Tent or a Bivy sack, 5lbs of tools, a First Aid kit, and must also have studded tracks and an extreme cold rated sleeping bag. It has become popular for racers to vacuum package their sleeping bags into bricks to save space. Read the example checklist and current rules for detailed information. How do racers keep drinking water from freezing? Water is carried on the racers back underneath the insulating layer. Also an electrolyte drink is often used. Besides warding off dehydration the freezing point is slightly below that of water. 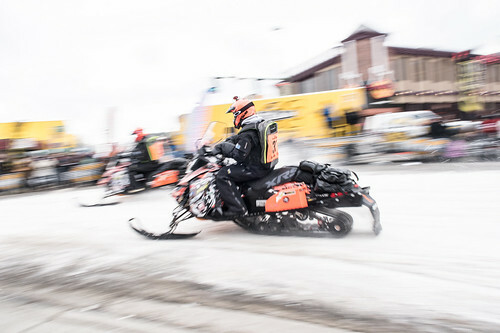 Some riders have their sleds outfitted with a small water tank that relies on the heat from the sled exhaust to keep it in liquid form. What is the coldest temperature racers face? 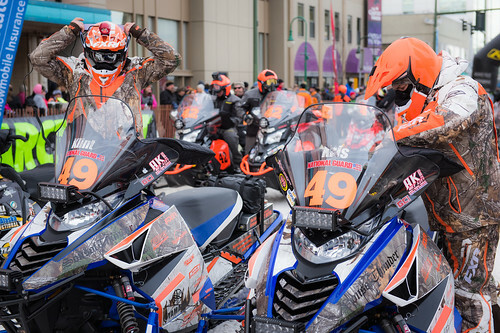 Some racers have recorded temps as low as -57 degrees Fahrenheit. Although most racers claim it can get much colder in the river basins and valleys. The wind chill factor at the speeds the racers travel are often in the subzero triple digit range, and often times are quite literally off the charts. Sled seats can even become brittle at these temperatures. How does a racer dress to prepare against such extreme temperatures? Well, we have to toot our own horn here. 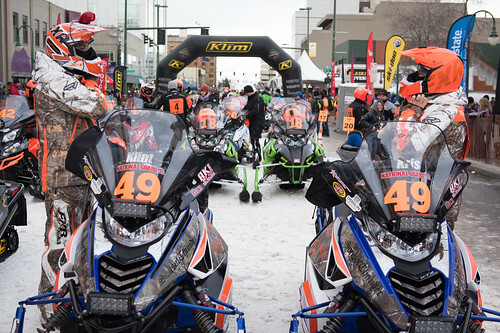 A good percentage of racers rely on Klim’s technical riding gear. It is this kind of extreme use that our layering system (base layers, mid layers and Gore-Tex outer layers) was built for. The human body really produces a tremendous amount of heat especially during high activity levels. 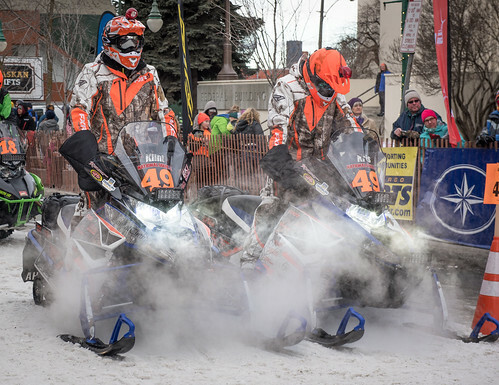 Iron Dog riders worry about getting to hot as much as getting to cold. Having pit zips and back vents and being able to remove layers make the Klim Layering system superior to any insulated parka and bib. Riders also wear Tec-Vests as well as kidney belts and other protective gear, and as mentioned before some sort of a hydration system. It seems each racer has their own little tweak in the way they layer or prepare that will make the winning difference. There are as many opinions on the subject of gloves as there are racers. However there are a couple common threads. Seams!! After nearly 2000 miles any misplaced seam will cause blisters. The palms and contact areas should be free of any seams. Water proof gloves are a must. Leave your ‘water resistant’ or DWR gloves at home. Only a durable full membrane liner (GORE-TEX®) will do. Most racers prefer light insulation on the palms and heavy insulation on the back of the hand. The Klim Togwotee fits the bill perfectly. What are the more challenging parts of the trail? What are some of the more unknown facts about the Iron Dog? At night, you cannot get out of your bivy sack to use the restroom. You will risk lowering your core body temperature to a dangerous point. And holding your bladder can actually make you colder. What is the answer? A military invented chemical that converts urine liquid into a gel. How much of a factor is inclement weather? Huge! Racers have reported that storms hit you like a wall without warning, giving you no chance to find shelter and completely removing any visibility. It has been reported that 8 men have failed to be able to set up one two man tent in such storms, this why bivy sacks are so often used. Sleds can be so packed with snow and ice by strong winds during the night that it will fill every cavity under the hood. When the hood is opened in the morning the snow will have taken on the shape of the underside of the hood. The ice has to be chipped out of the engine compartment to be able to steer or even to get air to the engine. Even after that one racer reported it taking 27 pulls to start a fuel injected Arctic Cat. No disrespect to AC. This is just par for the course under these conditions. Is that tape on racers’ faces? Yes, It is strategically placed Duct tape or surgical tape. It is there to protect the skin from any gap between the goggle and the Helmet. Frost bite will damage any unprotected skin almost instantly. I have noticed four strokes in the race, will they be a continuing trend? Racers that site the decision to use four strokes are focused on their reliability and on more consistent fuel economy. However two strokes still dominate the Iron Dog. Is there intense rivalry between racers? 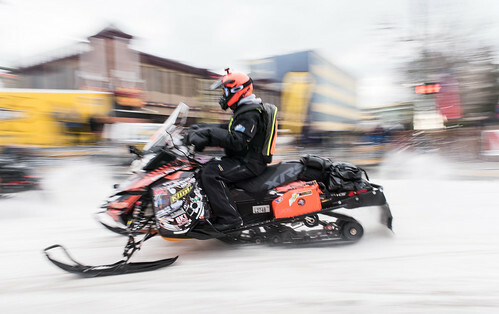 While it is a very competitive race, and some elements and strategies are very guarded and secretive, Iron Dog racers realize they are competing against the elements as much as they are competing against each other. Actually the veteran racers are very supportive and open to new teams. Perhaps more so than any other race.